It's been over 24 hours since the Solange/Jay Z elevator fight broke the internet and left us all scrambling to make sense of this capricious and utterly indifferent universe; now, at last, we may have answer. A source tells New York Daily News that the fight broke out after Jay Z announced his plans to attend Rihanna's Met Gala after-party without Beyoncé. 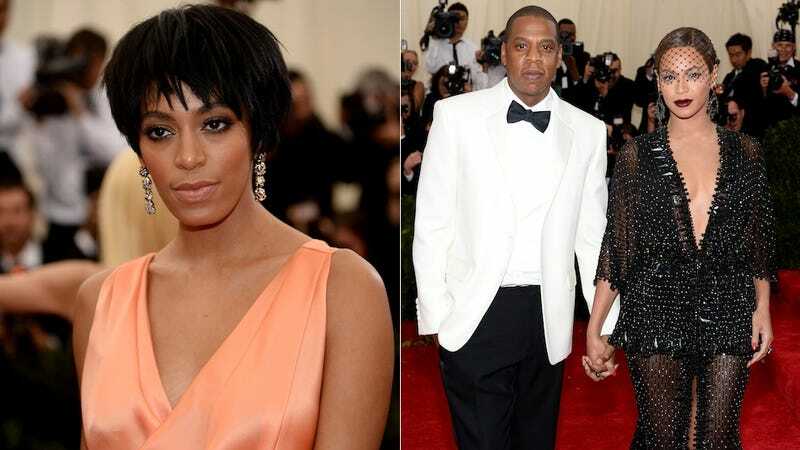 According to the unnamed source, the tension began 15 minutes before the fateful elevator ride, when a group of Solange's "non-famous friends" showed up and "caused a scene," insisting that they were guests of Jay Z himself. When Jay Z got wind of this, he allegedly snapped at Solange, saying "don't use my name." Solange became sullen; she said she wanted to leave. Jay Z then announced that he was going to go to Rihanna's party down the street — without an extra security detail, though, because Beyoncé wouldn't be coming. "[Solange] seemed drunk and irritated," said a second source. "She said, 'Why can't you go home?' and to Beyonce 'Why does your husband need to go to the club right now?'" An incensed Jay Z didn't back down. "You're one to talk," he replied, the source said. This sent Solange into a rage, states the source, and caused the fight. I don't know, I'm kind of suspicious of this account (all this drama — including an Instagram purge, which is the modern equivalent of public shunning — over after-party plans? Really? ), but we'll probably never know the truth. No one will ever really know the truth except for the Knowleses, the Carters, their security teams, and the two sources living in the walls of the Standard Hotel's elevator.